One of Britain's most iconic mediaeval castles in north Northumberland - you'll recognise it from Blackadder and Harry Potter. The Alnwick Garden, near Alnwick in Northumberland, is an inspiring landscape with beautiful gardens, magnificent architecture and unique features, including a treehouse and a poison garden, all brought to life with an impressive range of cascades and water features. One of the finest and most unaltered examples of a 13th century English manor house situated to the north of Corbridge. Part of English Heritage. Beamish is a world famous museum telling the story of the people of North East England during the Georgian, Victorian, and Edwardian periods. A fantastic day out. Set beside the river in a wooded section of the upper Derwent valley, Blanchland is one of most attractive small villages in the North Pennines Area of Outstanding Natural Beauty, on the Northumberland and Durham border. A medieval castle continuously owned by the family of the Earls Grey and their relations since the 12th century, and England's most haunted castle, in one of the wilder parts of Northumberland. Don't miss the famous Chillingham Wild Cattle. A beautiful thriving town steeped in history on the Tyne east of Hexham. Corbridge has a wonderful array of independent shops and restaurants. Once described as 'the finest church north of the Alps', there has been a church on this site for over 1300 years. Killhope is a fully restored nineteenth century lead mine, where you can experience for yourself the life and work of the lead mining families of the North Pennines. Known as the birthplace of England's Christian heritage, Lindisfarne is one of the few British Islands accessible by car. But watch the tide times! One of the best days out on the Roman wall. 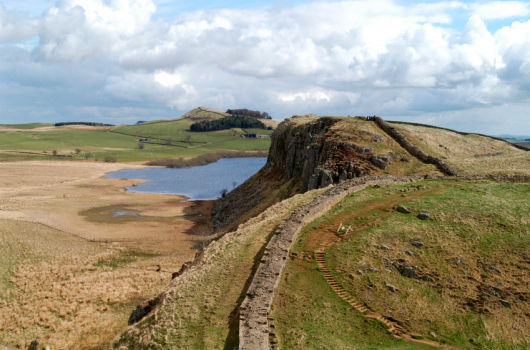 Enjoy the world famous Vindolanda Writing Tablets, live archaeology in summertime, the exclusive Eagle Eye 3D film and much more all in the heart of beautiful Northumberland National Park and central section of Hadrian's Wall.